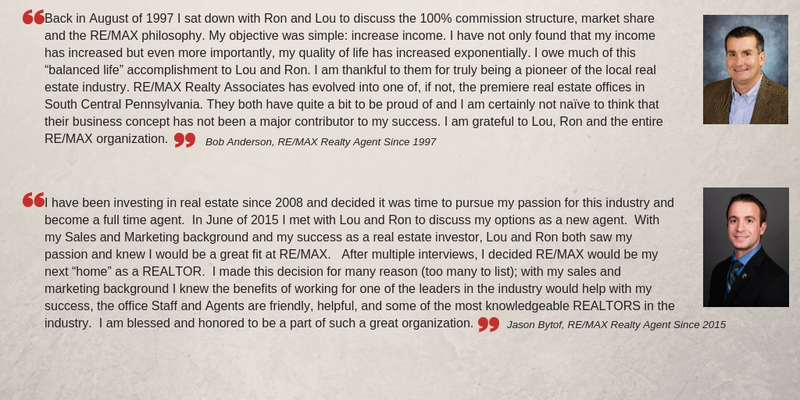 RE/MAX Realty Associates, Inc. was established in July 1980 by Lou Puliti and Ron Freedman. When they first started out, they opened an office in Mechanicsburg. With continued growth and success, the partners decided to move to a new office in Camp Hill to accommodate all of the new agents and staff. Today we are Central PA's "Premier" Real Estate Office! We Are A Full-Service Real Estate Office! We offer all the tools you need to help you succeed! RE/MAX Realty Associates strives to bring on the best of the best! We believe your goals will be met here. The employees are well trained, informed, and give the best customer service possible to our hard-working agents. The staff work with you the way you work best. They go out of their way to provide the ultimate service for your transactions. * You will NEVER be a Receptionist! We will help you set up your social media accounts if needed. This includes Twitter, a Facebook Business Page, and Instagram. We work hard at helping you become the best that you can be! In our office, you can work from anywhere because we are totally paperless! You can access your finished documents and transactions from anywhere there is an internet connection. We stay current with changing technology. We have an interoffice communications system where you are kept up to speed with news and events in the office. This office has state of the art networked copiers, conference rooms, computers with big screen TV’s for monitors, the fastest internet speeds from Comcast Business, all to make your work experience pleasant and productive! Upon hire, you immediately have a fully functional web site that compliments your style and design. The site has all the bells and whistles you need to promote yourself and your properties. It can be fully customized to meet your needs, now and in the future. We provide all the tools necessary to make your job easier. Your affiliation with RE/MAX and our office allows us to market your listings to various sites locally and nationally. We currently publish and market listings to over 58 websites! This complimentary service gives you an edge over the competition! We schedule training often, both in and out of the office. Not only will you be fully trained on the programs we offer, but you can take advantage of the numerous trainings and presentations we often have that include full courses to sales training. RE/MAX University offers training and short video presentations on many topics of interest, all at your convenience too! Tap into the Power of the Brand! With your RE/MAX relationship, you not only have access to MaxCenter, DesignCenter, LeadStreet, and University – you will be working for a company that is known internationally! 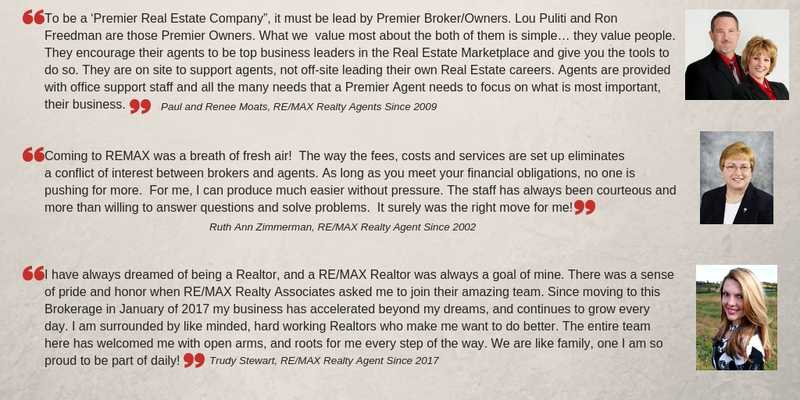 For over 40 years, the RE/MAX brand has been more than a name – it’s a personality, a dedication to clients and a commitment to excellence. RE/MAX International gives you many tools to use to leverage the full power of the brand in your own business. We make your move easy! Once you have made the decision to move to RE/MAX Realty Associates, we take it from there with our ‘No Worries’ moving program. We set you up in our various programs so you can hit the ground running! We have a dedicated Administrator who will make your transition smooth. We will resubmit your listings to the MLS, take care of your office memberships and license transfer. Training will be scheduled around your availability to help you get acclimated. We understand that your decision to move is a bold one. We are here to help you in any way possible to make this a very smooth and seamless transition. We encourage you to contact our Broker/Owners TODAY to discuss the office in more detail and to find out what it's like to work here! 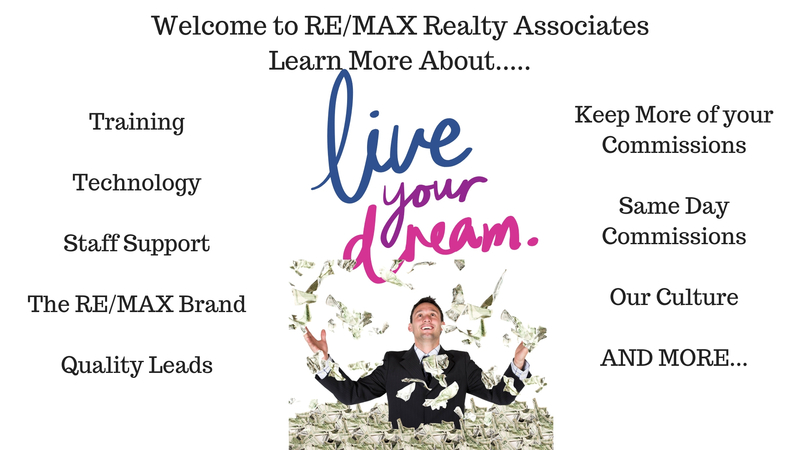 Click to Inquire About a Career at RE/MAX Realty Associates Now! Please review our agent testimonials.